Are You A Friends Maniac? Take this quiz and see if you are a true friends addict! 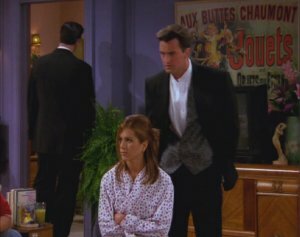 This is the F•R•I•E•N•D•S Quiz, by Alina, only this time, I'VE ADDED PICTURES! Friends - True or False? Take this quiz and find out just how big a friends fan you are! I am the grand master of FRIENDS quizzes and they got so easy I decided to create one myself! All questions on Series 5-10. FRIENDS - The One With the Easy Questions! Hello...I hope you know your trivia about -F-R-I-E-N-D-S because these questions will make your mind wonder for hours...or minutes. Think you know all there is to know about Friends try this quiz and see how good you really are.